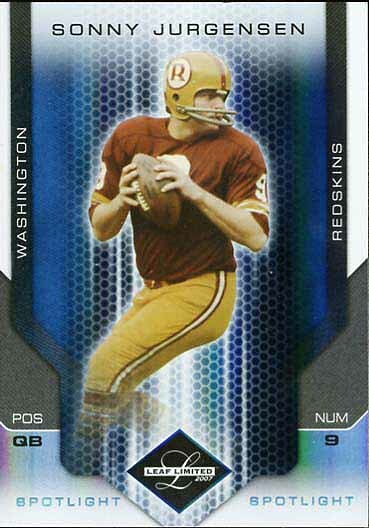 When I started collecting Redskins football cards one of my goals was to collect one of every Sonny Jurgensen card. When I looked at the cards that were issued while he was playing, it appeared to be an achievable goal. However, I quickly realized the trend of issuing new cards featuring past greats had made the possibility of collecting every Jurgensen card (or any other popular player) impossible. For example, today when I checked Beckett, there were 354 Jurgensen cards listed and 54 of those cards are 1-of-1 cards. So, I quickly gave up my goal of owning one of every Jurgensen card. A few months ago, I was doing some searching on eBay and came across one of those 54 1-of-1 cards of Jurgensen. I was amazed when I was able to pick it up for $35. Most of Jurgensen’s 1-of-1 cards are printing plate cards. I am not a big chaser of 1-of-1 cards so this will likely be the only one I ever own. 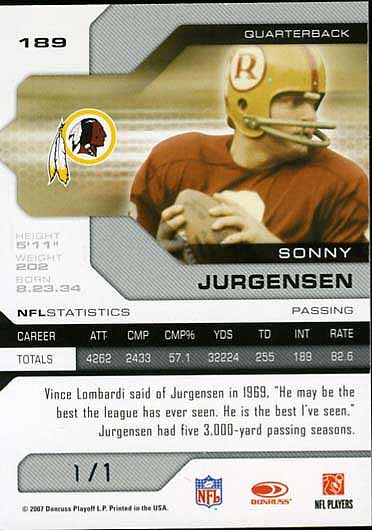 For the record, the card is 2007 Leaf Limited Platinum Spotlight 1-of-1 #189 Sonny Jurgensen.